Delicious and unique lentil falafel recipe Vegans Eat What? These unique balls are made using soaked lentils. Try it even if you think you don't like lentils because these tasty balls will change your mind! Heat a few tablespoons of mild oil in a pan and add the falafel. Cook the falafel, turning once, until brown on both sides. To make the dipping sauce, put the sauce ingredients into a blender and blend till smooth. This recipe is from Jennifer. Notes from Jena: To make this recipe you first need to soak the lentils for 10 hours. The lentils should puff up twice as much. After soaking, drain the lentils. If you are not using the lentils right away, place them in a covered dish in the fridge for up to 24 hours. 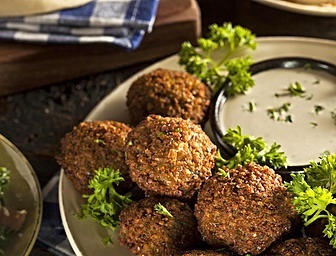 Serve the falafel over cooked basmati rice with the dipping sauce, or in a pita with tomatoes, cucumber and lettuce. The kibbeh also makes a great appetizer.